Blink-182 and Linkin Park have appeared in a new ‘Funny Or Die’ video which sees them go on an awkward first date with two strangers from Tinder. The comedy clip comes as the two bands announce that they will play stadium shows together in the US this summer. 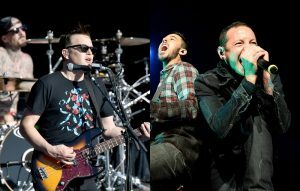 Linkin Park and Blink-182 will play Citi Field in Flushing, New York on July 28, with Wu-Tang Clan and Machine Gun Kelly on the same bill. They will also play Hershey ark Stadium in Hershey, Pennsylvania on July 30. Machine Gun Kelly appears at that latter show, but Wu-Tang Clan do not. See the dates in full beneath, along with the ‘Funny Or Die’ clip. Blink-182 recently shared a new track which the band dubbed the “strangest song they have ever recorded”. ‘6/8’ is taken from the deluxe edition of their latest album ‘California’, which is due out on May 19. It will come with 11 new tracks along with an acoustic version of the single ‘Bored To Death’ and the original album. The original LP was released in July 2016. Linkin Park, meanwhile, recently collaborated with Stormzy and Pusha T on ‘Good Goodbye’. The song features on the nu-metal band’s sixth album ‘One More Light’, which is also out on May 19. The post Watch Blink-182 and Linkin Park go on an awkward first date as they announce stadium shows together appeared first on NME.